NMB hosts a concert given by TALKESTRA the ensemble that not only performs new work but talks about it with the audience and composers. The programme is likely to include works by Aidan Bryson, Barry Mills, Phil Baker, Clive Whitburn, Michael Stephenson, Jonathan Clark, Ian Morgan-Williams, Ric Graebner, John Hawkins, Patrick Harrex and Peter Copley in a variety of pieces for clarinet, cello and piano. 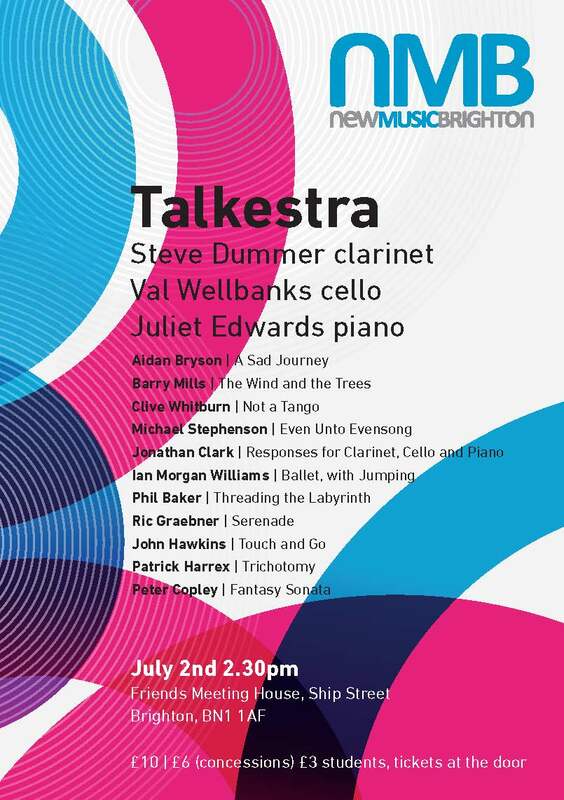 TALKESTRA is conducted by its founder Steve Dummer who is also the clarinet soloist. The concert is at the Friends’ Meeting House, Prince Albert Street, Brighton starting at 2:30 pm.